The University of Illinois is honoring three men who have helped preserve the history of the university. 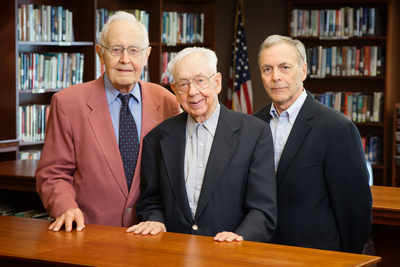 Recipients of the Chancellor’s Medallion are, from left, Winton Solberg, history professor emeritus; Maynard Brichford, the first university archivist; and William Maher, the current University Archivist. CHAMPAIGN, Ill. — The University of Illinois at Urbana-Champaign will award the Chancellor’s Medallion to three men who have dedicated their professional lives to preserving and making available the history of the university. Honored in a June 28 ceremony will be Maynard Brichford, the university’s first archivist; William Maher, the current university archivist; and Winton Solberg, a professor emeritus of history. The Chancellor’s Medallion is the highest campus honor, having been awarded just six times since it was first presented in 1999. “In this year when we begin our sesquicentennial celebration, it has become clear the most valuable and lasting legacy we have built as a university is our story. All of our great accomplishments, ideas and innovations trace back to the men and women who have been a part of this institution over the past 150 years,” Chancellor Robert Jones said. “Across their respective careers, these three have gone to extraordinary lengths to ensure that those voices will not be lost or forgotten. They’ve been the unwavering guardians of our history. Brichford said the establishment of the Student Life and Culture Archives was especially important for documenting university history. “There is a wealth of information that makes very interesting reading about student behavior and organizations over the years,” he said, adding that he considers himself primarily a historian. When he started the job, Brichford went to each department on campus and requested they make annual records transfers. They became the foundation for the Archives, he said. “The University Archives is the repository for the information that makes it possible for researchers to examine the history of the university,” Brichford said. Maher began work in the Archives in 1977, and he succeeded Brichford as university archivist in 1995. During Maher’s career, the Archives has grown in scope, staff size and professional stature, and it has upgraded its facilities. Solberg once considered becoming a lawyer, but his experiences fighting in Europe during World War II convinced him to study history in order to understand why such events happened. He taught in the history department at the U. of I. from 1961 until his retirement in 1992. A dedicated user of the Archives, Solberg wrote about university history throughout his career in a way that acknowledges both the positive and negative, and he has continued to do so in retirement. He is currently working on an account of the U. of I. during the presidency of Edmund J. James (1904-1920). He has also shepherded graduate student research and dissertations on university history. Research and writing about the university’s history have shaped his life, Solberg said. “I’m interested in my work. I enjoy my work. I serve a useful purpose to point out some of the triumphs and failures of what the University of Illinois has done,” he said.